Please write comments and suggestions regarding our internet pages into the following field. Accepted languages are Kiswahili, German and English. PLEASE NOTE: To prevent abuse of our guestbook, e.g. for placement of all kinds of Ads and Spam, new entries will only be shown after our confirmation. Thanx for sharing such useful post keep it up :) (modified message: a Hyperlink was removed by the webmaster). I am happy to visit your page again. Every now and then I see new progress. I congratulate you on your success in the form five selections. I have learned that 18 of your 2017 form 4 students have been selected to proceed with advanced secondary education (form 5) and 2 have been selected to join technical colleges. My heartfelt congratulations on that. One question: Is there a plan to roll out a-level (form 5 and 6) studies any time soon? Don,t you think it is about time now? Given the facilities and support you get from friends, I am of the view that you should embrace that idea now. Let's move to new heights: let's explore new horizons! Just my thoughts! Otherwise I wish you well. Dear Mrs. Liani. Your son Salomon will be warmly welcome at our school. Dear Students and Teachers of KSS. CONGRATULATIONS to all former students of form IV (2017) and their teachers. As the students of the year before, these students performed very well at the final examinations 2017. Thus they and their teachers worked hard and successful and this earns my deepest respect. Thank you for the nice pictures. I have seen all of them. What a humble institutional memory!- from school's humble beginning in 1985 to its heights to date. Quite gratifying - especially to those who were early students then - including 3 of my siblings and many other relatives and friends. About the leadership: I agree that the new Headmaster needs some assistance here and there, both from his predecessor as well as the other colleagues who work with him. But at the end of the day he is the leader and is the one who will be accountable to the school manager, parents and students for the time being. I am sure he is not oblivious of the fact that apart from the fact that the school has come of age, some efforts and energy were undoubtedly devoted by those who led it since 1985. They say old is gold ..., and I add "but gold is never old"! Once again I wish all of you all the best! P.S. : I agree with the final statement in your post :-) , but in the last four weeks I could convince myself that Mr. Kiwara works hard to minimize interference with the headmaster. Instead he truly holds himself in the background and tries to support Mr. Shayo as much as possible. Congratulations Mwl Fredrick Shayo on your appointment as new Headmaster of my alma mater. I wish you all the best. Congratulations are also in order for Mwl James Kiwara for gracefully retiring after long and gratifying service. I wish you Mwl. Kiwara very good health and happiness. Just note: once a Headmaster always a Headmaster! Well done, very nice Article with really helpful informations! Love to read more from you soon. Cited from the original post by the webmaster. The message is an example of frequently occuring comments which include links to do Advertising. The link was removed. Dear Sosthenes (Dr. Materu), I am happy to see that you continue to follow the development of you former school. I just visited the school and enjoyed the typical warm atmosphere and hospitality. The school continues to improve and all former students are invited to contribute. I am thrilled to see very many new teachers and a few old ones who taught me. I am also proud that my alma mater (former school) is making progress against all odds. 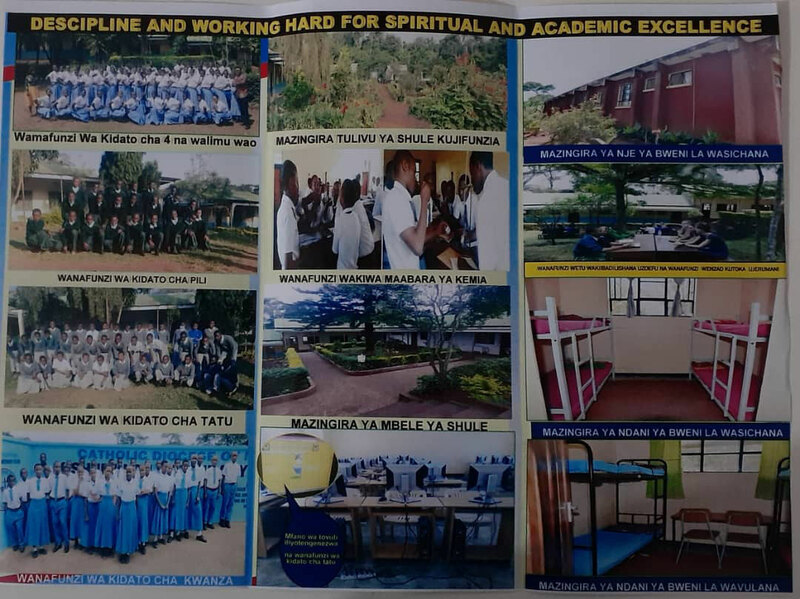 I am equally proud of the firm school management and sponsors who have availed their unwaivering suppor over the years. To all of you, and of course to the current students, I say "aluta continua". CONGRATULATIONS to the good results in the final examinations CSEE of 2015 (http://www.necta.go.tz/csee_results) ! You obviously did a good job. Ndugu Wanafunzi, Walimu na marafiki wa Kishumundu Secondary School! Napenda wageni wote, wanafunzi, walimu na marafiki wa Kishumundu Secondary School heri ya Krismasi na Mwaka Mpya. Dear members and friends of Kishumundu Secondary School! Merry christmas to all of you and your beloved families. I hope you will have a nice christmas time. For the year 2015 I wish health and success to all of you, but especially to the new form IV, which will have the final examinations at the end of this year. I arrived safe, but very tired back home. Please let me emphasize that I extremly enjoyed my time in Kishumundu. Thank you or all your sympathy, friendship, nice wishes and gifts that I was granted with on my stay and at the farewell party. May I wish all the best to you. Asante Sana. Your help is welcome at any time. This is something good to all of us, we need to do more and support the effort that has made, i am planning to help on how we can use things like SMSS school Management system software. it seems that we may miss to see each other once more. However, I am happy to have contact to you via the internet. I wish a successful and delighting start in Tanzania. I am not sure if I will be in Moshi between those dates, the reason being that I will be resident in Dar es Salaam upon my return. However, if I happen to be in Moshi, I will pass by. Congratulation to your graduation to a doctor of law. I will be volunteer teacher at Kishumudu Secondary School from 5th of august on till almost end of august. I would be highly exicted if I could meet you there. Thanks. I will definitely visit the school. we are very happy to hear, that you successfully finished your studies. CONGRATULATION Dr. Materu. We are very proud of you. Please visit our school when you are back in Kishumundu. It's me again. Warm greetings from Berlin, Germany. This time I would like to inform you that on 7 July 2014 I officially finished my PhD and graduated here at Humboldt University of Berlin. I will soon come back home and visit you. Thank you for your compliments. I do not remember you, given that you joined KSS the year I left. But I am humbled if I am truly a role model for you. I wish you all the best. thank you for the nice compliments. Our homepage is selfmade by our webmaster using the free of charge modular webpage building offer of http://jimdo.com . We will continue! I realy thank God the Almighty for having this KSS site today. I have many things to share with you colleaguesn but let me first fly my congratulation to the one I considered my role model; the honorable Sosthenes Materu. Big up brother for the tremendous efforts that u have made. I remember by the time I joined form 1 there it was 2000 the year when u completed. MAY GOD LEAD YOUR PATHS FOREVER. I will use the site to post more during my ample time. Bye for now. I am deeply impressed by the good results of the Form IV students in the final examination of 2013. Congratulations to position no. 307 in the national ranking of all Tanzanian Secondary Schools with students undergoing the Form IV examinations. YOU DID A GOOD JOB ! I hope you will go on like this. Dear friends at Kishumundu Secondary! I want to send you warm greetings from Germany. I hope everything is fine at school, I miss all of you and hope to visit you again soon! Tuliambiwa na binafsi nimekubali,ila shule ni sehemu ya Maisha yangu,Imenijengea uvumilvu,imenipa ujasiri,imenifanya kuwa timamu hsa ktk Shughuli ngumu ambazo nimekutana nazo ktk Maisha,&bu yake leo ninajiamini kwa lolote,kimatendo Kimaongezi na Mengine Mengi. Nakushukuru sana Mwl J Kiwara hii hasa kwa niaba &bu siwezi kuwataja wote.Hurma ynu Pia imenifikisha hapa nilipo jpo vikwazo ktk maisha ni kama Sala ya asubuhi,. Ninawapenda wanafunzi wote wa Kishumundu,Walimu,Walezi pamoja na Jamii nzima inayo izunguka Shule kwani Bila Hao pia hakuna Kishumundu Sec. Kwnu walezi Pamoja na Walimu kama mlivyofanya kwangu bac hata kw yyte atakayejitokeza kuonesha tofauti ya kinidhamu bac kiangaliwe Chanzo,huwenda hta Chimbukoni kwa Muhusika ndo Tatizo la yy kuyumba kinidhamu.ilinitokea Mimi karibu miaka 11 iliyopita hapohapo na UBINADAMU WENU leo umenifikisha hapa nilipo japo ckumalizia hapo Masomo Yangu,Ila Kishumundu ndo Ummekuwa Mzizi Mkuu wa Kila ninachokifanya. Narudia tna ninawapenda Sana Nakumbuka Pia Dada Salome,Mama Ngandu na Mrs Lyimo Kama Wazazi na Walezi Msichoke Kuwasamehe Vijana na Watoto Wnu. Once again I am delighted to see the tremendous progress the school has made. The school looks just amazing! From the pictures it is clear that there is a lot of hard work going on. It is, in the same way, evident that there are many dedicated people behind this success. It is my hope that all this will remain sustainable. Once again I sincere greetings from this side, and express my heartfelt congratulations to all of you. I wish you well. after my first visit at Kishumundu Secondary School in 2012 I recently visited the school in july 2013 once more. Thank you for the warm welcome and your great hospitality. I am deeply impressed by the improvements that have been made within one year. Congratulations to the headmaster, his teachers, the staff, the students and all supporters for the excellent work. Please continue exactly that way!! Thank you for your complements and good wishes. I hope the students will truly find my story inspirational and motivational i.e. if at all they read it! Congratulations! Your entry is awesome and an outstanding example for success of former students of Kishumundu Secondary School. Certainly it will be a great inspiration and stimulation to all current and future students at Kishumundu Secondary School. I wish you all the best for your PhD project! I am more than delighted to find this page. I would like to share my story which entails my connection with this school. I studied at Kishumundu (1997-2000) under the able leadership of Mr. James Kiwara. I do not regret to have studied there. Being a last born in a family of a single parent (mother), I was lucky to be one of the beneficiaries of the support given by friends from Alexander and Kopenikus schule. was sponsored/ supported by Mr and Mrs Ferdinnand Kosch. 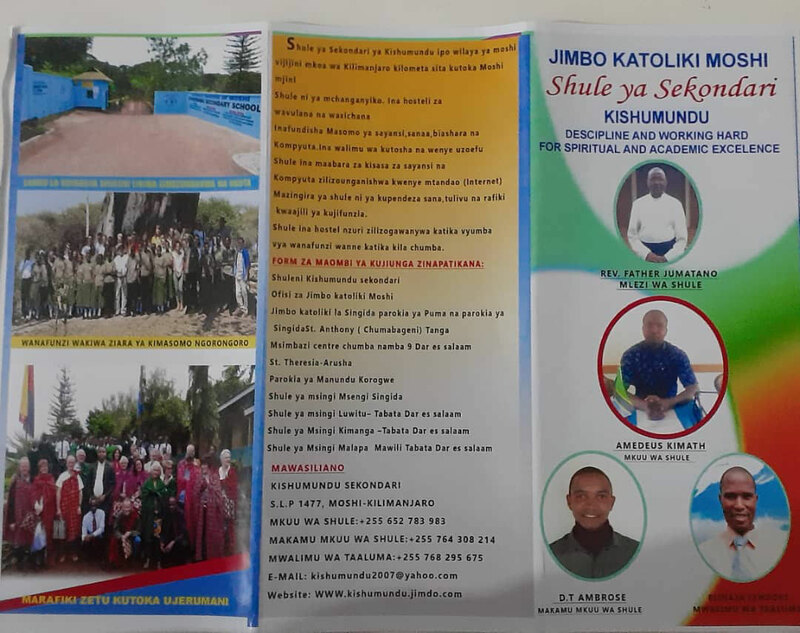 Between 2001-2003, having finished my four-yea ordinary level of secondary education at Kishumundu, I joined Majengo Secondary School for my advanced level secondary(form fiv and six. After my secondary education I excelled well in my studies and qualified to pursue Bachelors degre in Laws (LL.B) at the University of Dar es Salaam (2004-2008). After my LL.B, I worked for one year before joining the University of the Western Cape in Cape Town, South Africa where, in collaboration with Humboldt University in Berlin, I obtained a Master of Laws Degree LL.M) in the year 2010. Interestingly, my connections with Germans did not end at Kishumundu. My masters education was sponsored by the German people through their widely known German Academic Exchange Program (DAAD). I was taught and supervised (for my Masters Thesis) by a German Professor from Humboldt University, and I partly did my studies at Humboldt University of Berlin in form of a summer school. As I also passed my LL.M well, the DAAD grated me yet another three-year scholarship to continue with doctoral studies (Ph.D) in law. Thus, since 2011, I have been a doctoral researcher at both University of the Western Cape in Cape Town and Humboldt in Berin, and I expect to graduate from Humboldt University in Berlin (God wiling) in early 2014. Thereafter, I will resume lecturing at the University of Dar es Salaam where I am employed as a law lecturer. While in Berlin I was able to meet Mr. Kosch and his wife, Christina, who traveled all the way from Southern Germany just to come and meet me in the cosmopolitan city. I was happy to meet them again, for I we had not met since 2002. I learned that they were both retired, but undoubtedly not tired. Therefore,my memories of Kishumundu as a place which shaped my educational aspirations will not fade easily. The headmaster in particular was always my main inspiration: a father-like figure and strong leader.In addition, all the teachers shaped my, I believe, God-given ability very well. In particular, I am indebted to the following teachers wo taught me various subject: Mr. Kiwara (Civics) Mr. Modest Noya (geography and Kiswaili), Mr Albert Minja (physics), Mr. Wilson Kira (Chemistry and Mathematics), Mr. John Lymo Chemistry), Mr. Francis Mlingwa (English), Mrs Monica Mbeu (Biology) and Mr. Daniel Njiu (English) They all instilled very many values in me, which I will always cherish and carry with me; they define me today. I learned studying hard and for a purpose, working hard, self-reliance, discipline, respect, determination, and above all, remaining focused to on's own defined goals. As I go up the education ladder,I always reflect on those early days and those wonderful people who molded me in school. I was glad that after my form six education, before joining University, I was able to go back to Kishumundu where I taught for one year as a volunteer, non-professional teacher (I was earning a modest 'salary' of about 30(thirty) US Dollars per month!). It gave me great pleasure to work with the same teachers who, two years back, had been teaching me. But I must admit that even as I worked with them as a co-member of staff, I was still their student in many respects. As I now look forward to getting my PhD, I also look forward to going back to Kishumundu as a proud alumnus not only to share my story and experience with the students and teachers, but also to encourage and motivate the students to remain focused towards realization of their dreams. Lastly, I am glad to see that the friendship and co-operation that started in the late 19990s between the school an German friends is still intact and growing. I am very happy to learn that things which we considered a nightmare during my time at Kishumundu, nmely internet and hostel accommodation, are now a reality. It is my hope that these facilities will have a tremendous effect in terms of making learning and teaching easier, as well as widening the catchment area of the school in terms of attracting students from all over the country. I particularly congratulate the leadership of Kishumundu secondary school for being able to create, nature and maintain the trust and confidence of us all. This is something that many others have failed to do. Merry christmas to all of you. I hope all of you will have good health and a prosperous, peaceful and lovely year 2013. I am already in pleasant anticipation to see you in summer 2013. I'm from a pupil from Kopernikusschule (germany). I would like to come to you in 2016. I will see your country!!! im from german and im wish you lots of luck. you are great,you are great peoples. good luck and have a good time! It's amazing. We like your school. The engagement of your members is realy great. Your headmaster Mr. Kiwara works grandiose. Often we will visit your homepage and inform us about your interesting activities in the future. after five weeks of volunteering at the KSS it is time for me to say goodbye to my fellow colleagues, the staff and the students of the Kishumundu Secondary School. I hope to see them again. I was warmly welcome by the school community and had a wonderful time here. I return home with plenty of wonderful impressions that will last forever. Thanks to all those with participated in these unforgetable moments. Of course I will support the KSS and follow its future developments with greatest interest. THANK YOU FOR A WONDERFUL TIME IN TANZANIA! This looks wonderful - especially the photos! It's very informative and interesting. One small minor suggestion: instead of using the term academical for the subpage, i would suggest using the term academics. Congratulations to your fine new homepage. We will follow with attention. I am very proud that we, the webmaster and me, create a homepage for the Kishumundu Secondary School. I hope it will have plenty of visitors!